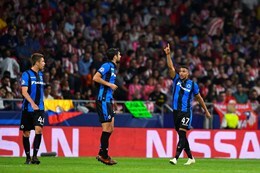 Club Brugge midfielder Arnaut Groeneveld Danjuma was delighted to net his maiden goal in the Champions League in his side's 3-1 loss to Atlético Madrid at the Estadio Metropolitano on Wednesday evening. At the same time, the Netherlands U21 international has labelled his sensational strike in the 39th minute useless as Club Brugge ended losing the game after he had equalized. Antoine Griezmann had opened the scoring for the Spanish team with a neat finish in the 28th minute but Danjuma restored parity when his fierce right-footed shot from well outside the penalty area nestled in the far corner. ''I am happy with my goal, but when in the end you lose 3-1 it is just something for the statistics which does not really help you further,'' said Danjuma to uefa.com. ''They need only a few chances to score, but I think it was not necessary to concede the second and third goals." Danjuma is among the three new faces in Netherlands provisional squad for the upcoming games with Germany and Belgium.